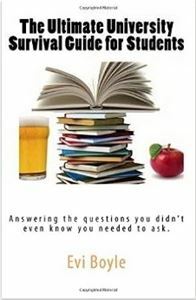 …You could say I’m the eternal student, school, college and university twice, I loved it so much now I work in a university full time answering the questions I’ve covered in the book on a daily basis. The ultimate student survival guide has been written in stages that cover pretty much everything, …And we are talking everything here. From the moment you decide to go to university until the glorious day you finally get that certificate in your hot little hand, filling in all the spaces in between it will answer 99.9% of your questions; the other 0.1% is common sense. Written for students of all ages, backgrounds and abilities it is set out carefully into specific sections that are easy to get your hands on without too much hassle. Start at the contents page and there you will find issues split into main headings ‘Fresher’s Week’ is a good example, under this you’ll have lots of sub headings which will direct you to a specific page filled with information, addresses and web links which will help to resolve any issues you may have quickly and effectively. …There are even a couple of sections on parents and the kitchen sink.